Eastern Suburbs top Club once again with many awards!!!! 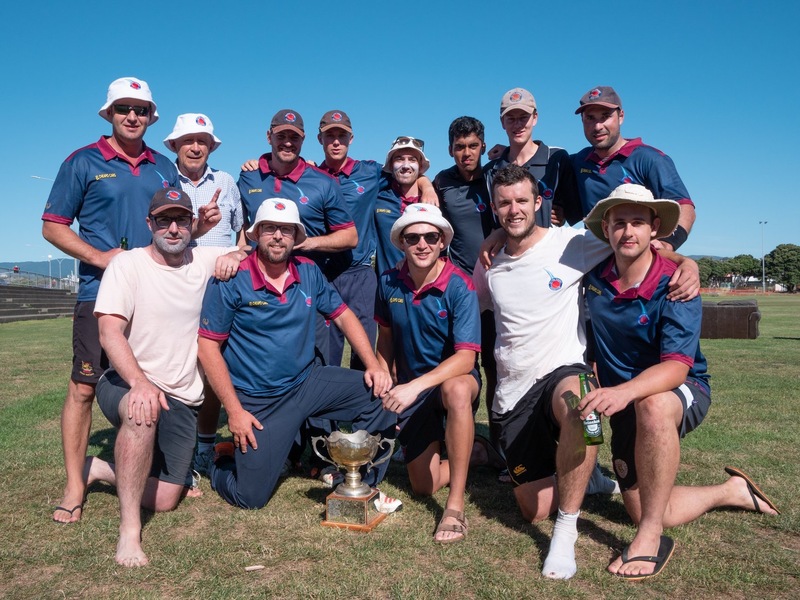 Eastern Suburbs Cricket Club was the big winner on the night as they were presented with the Pearce Cup and Ewen Chatfield Cup, capping off another memorable summer for the club. Easts were also well represented in the individual awards, with allrounder Jamie Gibson taking out the Bruce Murray Medal and the Premier Men’s Club Cricketer of the Year Award. East’s Charlie Thurston’s performances this summer were also recognized as he was presented with the May Cup for highest score of the summer and the Sam Platt Cup for best performance of the summer. Eastern Suburbs Cricket Club head coach Lance Dry and Taita Cricket Club head coach Sriram Krishnamurthy have been added to the Wellington Firebirds coaching staff for the 2019/2020 summer of cricket. Both coaches join recently appointed head coach Glenn Pocknall at the helm of the Firebirds, Dry as assistant coach and Krishnamurthy as pathway and specialist batting coach. It will be the first taste of professional cricket coaching for Dry, a former Wellington player and selector, having proved his credentials at club level with the highly successful Eastern Suburbs club, winner of the prestigious Pearce Cup in 16 of the last 18 years. Dry brings a wealth of cricket knowledge to the role having made five first-class appearances for Wellington and has a strong understanding of the local crop of players. Krishnamurthy has worked his way through the Cricket Wellington coaching system and has supported the development of some of Wellington’s best emerging talent as head coach of the under-19 and provincial A teams. His coaching talents have also been recognised at national level, where he has been involved as the New Zealand A batting and spin bowling coach for the tour of the UAE and the one-day home series against India last summer. He was also batting coach for last year’s Women’s Emerging Talent Programme and was head coach of the New Zealand XI for their tour match against Bangladesh last summer. Krishnamurthy will also act as the head coach of the Wellington Provincial A team, as well as provide specialist batting coaching. Cricket Wellington CEO Cam Mitchell said Dry and Krishnamurthy were the ideal candidates to support Pocknall in leading the Firebirds into the future. Lance is a winner with a great cricket mind – he has impressive knowledge of our local players and will challenge our best players to be better and take the Firebirds team to an even better place. He leaves a successful career in banking to follow his coaching dream which is a great story in itself. Sriram is a hugely experienced coach and has held a number of important roles both at regional and national level. His wealth of knowledge and experience will be vital, especially for the development of the new crop of young talent we have coming through our system. Both coaches will officially begin their roles in June. 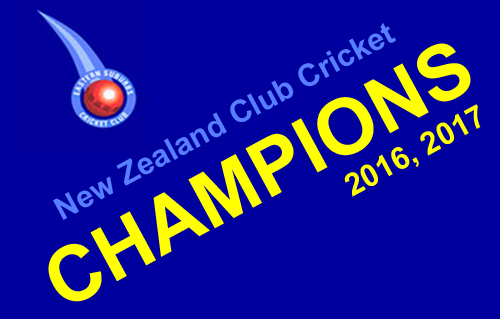 The 25th anniversary of the NZCT National Club Cricket Championships is being held at Cornwall Cricket Club from Tuesday April 2nd to Sunday April 7th 2019. The 25th edition will feature Greerton (Northern Districts), Napier Tech Old Boys (Central Districts), Eastern Suburbs (Wellington), St Albans (Canterbury), Parnell (Auckland) and Green Island (Otago). This will be our 9th appearance at the National Club Championships for Easts previously attending in 1995, 2002, 2003, 2012, 2013, 2014, 2016 & 2017. We won the title of National Club Champions two years in a row 2016 & 2017 and want to repeat the process this year. The Easts players selected to participate are Matt Ansell, Michael Bracewell, Peter Connell, Jeremy Dean, Lance Dry (c), Andrew Fullerton-Smith Luke Georgeson, Jamie Gibson, Kaleb Gilhooly, Lauchie Johns, Jimad Khan, Ben Orton, Ili Tugaga and Jed Wiggins. GO THE MIGHTY EASTS !!!!! 2019 PEARCE CUP CHAMPIONS !!!!! Outstanding victory with outright win by 8 wickets. Excellent TEAM effort with all players contributing well. Congratulations Lance and the Premier team !!!! for the 18th year in a row !!! 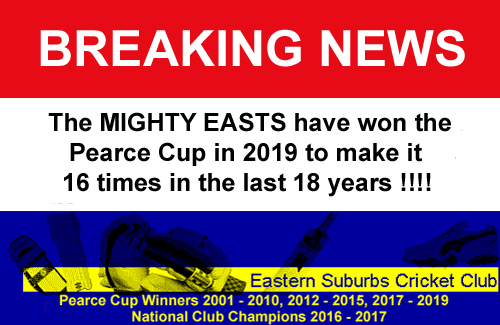 The MIGHTY EASTS Premier Men team have qualified for the Pearce Cup Final for the 18th year in a row !!! This was a close one with Karori being top qualifier with 105.43 points, Easts 2nd with 102.92 and Hutt Districts 3rd with 102.91 points. We got there by 2 runs !!! 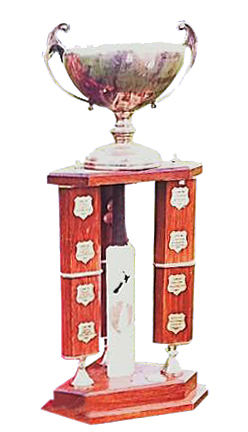 We have won this trophy for 15 of the last 17 years so lets get down to the Basin Reserve and support our MIGHTY EASTS team win it for the 16th time!!! Easts 19 year old Luke Georgeson scored 125 in the inaugural game against the New Zealand Maori Schoolboys at Karori park, Wellington. Luke reached his half-century first off 59 balls, littering Karori Park with quality cricket shots showing why he’s highly rated by Cricket Wellington and national age group selectors. He then raced to his century, reaching the milestone in 148 minutes off 114 balls, finding the boundary 14 times. He eventually went out for 125 after featuring in two good century partnerships that setup the winning of the game for the Governor General’s XI. 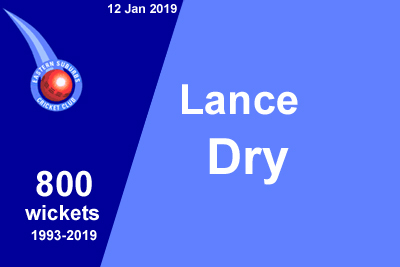 Premier Men’s captain Lance Dry has achieved 5,000 runs for Easts in the CricHQ T20 game against Karori Premier Reserve on Wednesday 20 February 2019. Lance achieved his first 1000 runs in 2001, 2000 in 2006, 3000 in 2010, 4000 in 2014 and now has a total of 5004. In his 26 years playing for the MIGHTY EASTS (1993-2019) he has amassed:- 5,004 runs, 804 wickets, 329 fours, 39 sixes, 182 catches and 17 run outs. An awesome achievement - Congratulations Lance!!!! Easts Premier Men young pace bowler Dylan Sharma has been selected to go to Bangladesh to play for the New Zealand Under 19 team. 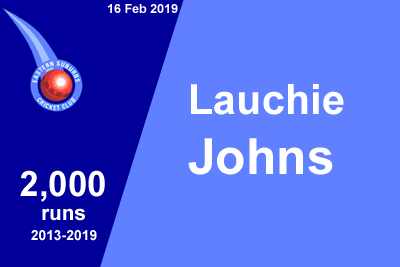 Lauchie Johns has achieved 2,000 runs for Easts on the first day of the game against Karori on 16 February 2019. Lauchie achieved his first 1,000 runs in 2017 and 2 years later has accumulated another 1,000 runs to make a total now of 2,001. Since 2013:- 2,001 runs, 253 fours, 23 sixes, 139 catches, 17 stumpings, 4 run outs and even has 3 wickets. Excellent effort - Congratulations Lauchie!!!! On the second day of Easts Premier Men’s two day game, against Hutt Districts, 3 records were broken!!! set a new record for the highest score in all forms of the game with his outstanding 242* on Saturday 9th February 2019 - previous best Jamie Gibson 201*. 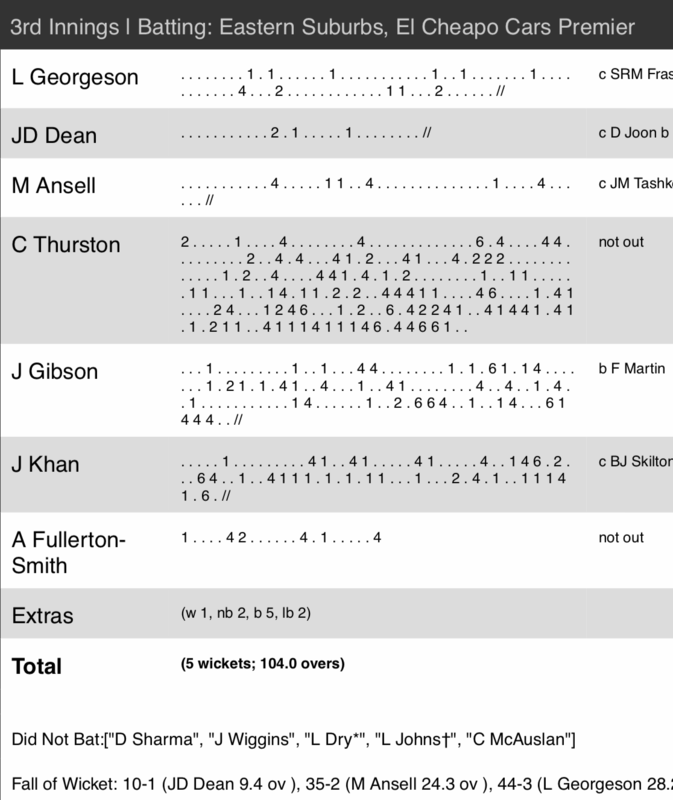 Very important innings in that Easts were 92 behind on the first innings and needed to bat as long as possible. His 242 not out included 33 fours and 7 sixes. for Charlie Thurston 242* and Jimad Khan 77. Previous record was 143 scored in 2010 with Scott Golder 103 and David Holt 52*. The 4th wicket partnership for Charlie Thurston 242* & Jamie Gibson 108 in the same game was 191. 3. Highest innings in a Two Day game 488.
previous best was 449 against Karori in 2015. It was also our 2nd highest innings in all forms of the game with the current record of 550 set last year against Johnsonville in the Pearce Cup final. Congratulations Charlie, Jimad and Jamie - absolutely brilliant !!!!! Ewen Chatfield Trophy back in our trophy cabinet again !!! 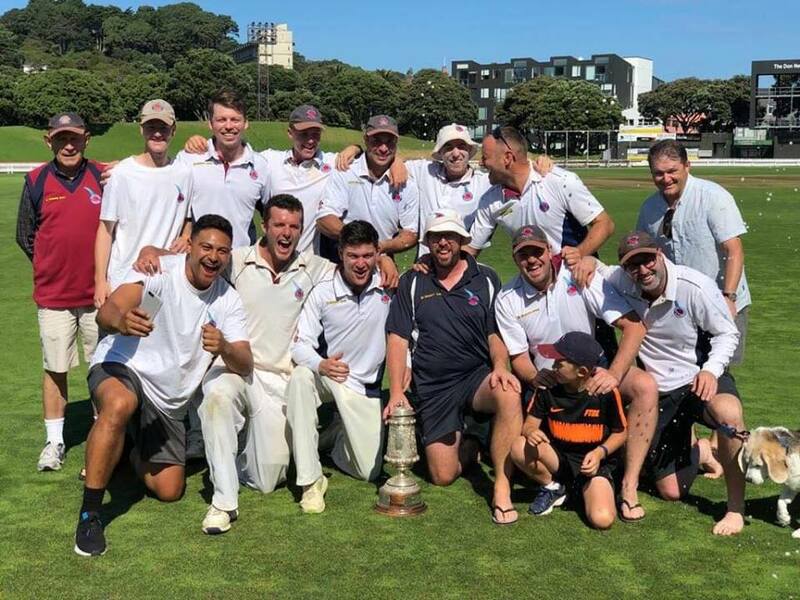 Yes we said we would get it back in 2019 and the Premier Men team achieved this on 27th January 2019 in the one day final against Johnsonville at Kilbirnie Park. Johnsonville struggled to get runs and scored 212-10 after some tight bowling from Daylan Sharma 2-20, Jed Wiggins 1-26, Peter Connell 2-39 and Jamie Gibson 3-56 along with 2 run outs by Lauchie Johns and Jed Wiggins. We responded with some good batting achieving the target with 7 overs to spare scoring 217-4. All batters contributed well with Jeremy Dean 29, Lauchie Johns 38, Matt Ansell 35, Charlie Thurston 14, Jamie Gibson 60* and Jimad Khan 49*. Congratulations to the MIGHTY EASTS Premier Men team!!!! 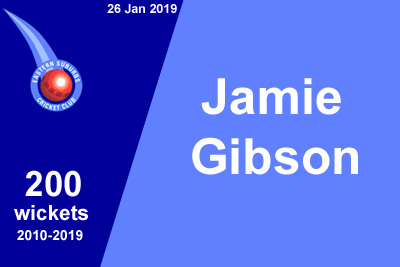 Jamie Gibson achieved his 200th wicket for Easts in the game against Taita on 26 January 2019. Jamie achieved his first 100 wickets in 2015 and 4 years later has accumulated another 103 wickets to make a total now of 203. It should also be noted that he has also scored 3,675 runs to date, taken 48 catches, 7 run outs, 358 fours and 94 sixes. A true all rounder !!! Excellent effort - Congratulations Jamie!!!! The T20 competition is now live on CricHQ with the full draw available. The competition will conclude on the 24th of March at the Basin Reserve. The format will see the top 2 teams from each pool proceed to the Quarter Finals. 5. Venues for Quarter Finals and Semi Finals will be determined once the progressing teams have been found. Prize Money for the competition will be $1500 for the winner and $500 for the runner up. Please note that venues may need to be changed due to council request. Click on the CricHQ T20 button in the MENU to view the Draw/Results and a link to the CrichHQ Match Centre. The Mighty Easts captain ’Lance Dry’ has now taken ’800 wickets’ in Wellington Club Cricket in the period 1993 to 2019. Lance achieved this with his 3 wickets in the crucial game against Johnsonville on Saturday where Easts had to win, and win well which they did, to qualify for the one day final of the Ewan Chatfield Trophy in 2019. Lance is the only Wellington Club player to have achieved 800 wickets in the last 54 years !!!! He has also captained the side in winning 15 Pearce Cup Finals out of 17 attempts as well as NZ Cricket National Club Champions in 2016 & 2017. Congratulations Lance – an AWESOME ACHIEVEMENT !!!!! 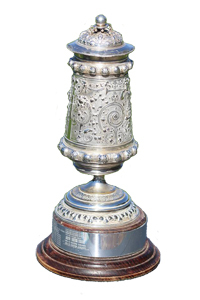 The Twenty20 Cup will again run in early 2019. The format will run similar to 2018 where there will be group games followed by quarters, semis and a final. The first round of matches will take place on the week commencing 21st of January 2019. All 12 premier teams are automatically entered into the competition. Each club is able to enter 2 teams in this competition with the entry fee for this tournament being $150 (excl GST) – Entry will go directly towards the Prize money pool. There will be no prize money for the MVP this season. Once all entries are in the draw and timetable will be sent out to everyone ASAP. Easts Jamie Gibson scored 66 not out showcasing a range of powerful and precise hitting in a 126 run partnership that led Wellington A to a seven-wicket victory over Auckland A in the final of the Provincial A Quadrangular T20 tournament in Taupo. After losing the toss and being asked to bowl first, Wellington restricted Auckland to 156 off their 20 overs with Easts Jed Wiggins one of the top bowlers with figures of 2-25 off his four overs. The win completed Wellington’s 100% success rate at the tournament. Get behind the Firebirds and Blaze this summer! 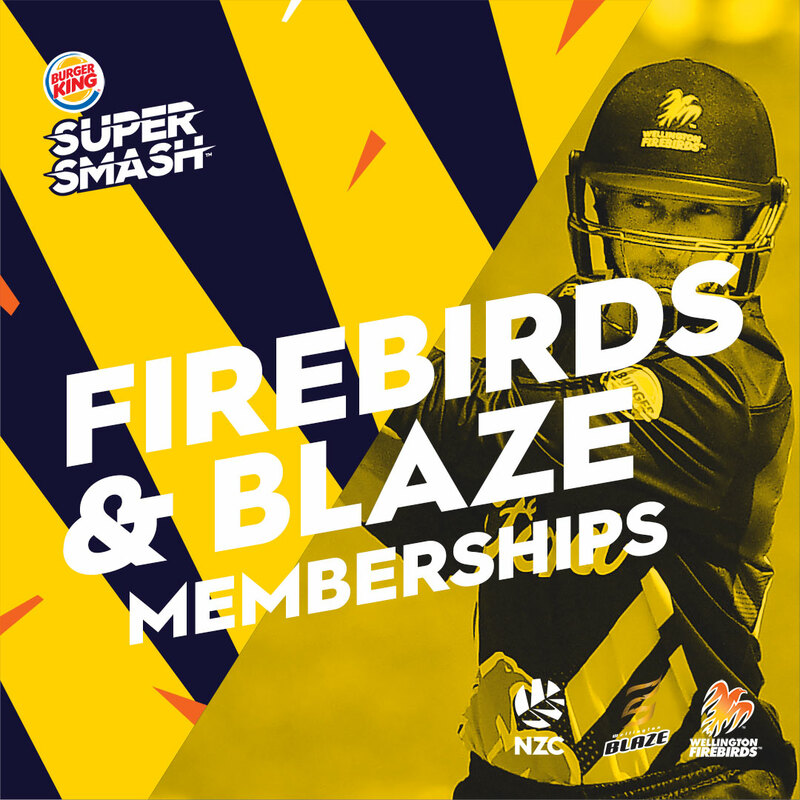 Be the first to get a Firebirds and Blaze Super Smash membership! Each membership gives you two passes to every Burger King Super Smash match this summer (including the finals), as well as merchandise and unique member offerings. Be quick there’s less than 50 left!!!! Andrew Fullerton-Smith achieved his 2,000th run for Easts in the game against North City on 9 December 2018. Andy achieved his first 1,000 runs in 2015 and 3 years later has accumulated another 1,000 runs to make a total now of 2,018. It should also be noted that he has taken 101 catches and has 12 stumpings !!!!. Excellent effort. Currently Easts have three Premier players in the Wellington Firebirds squad - Michael Bracewell, Jeetan Patel and wicketkeeper Lauchie Johns. Congratulations Michael, Jeetan & Lauchie !!!!! Easts Jamie Gibson and Jed Wiggins have been selected in the strong Wellington A team for the Provincial A Quadrangular T-20 tournament in Taupo. Congratulations Jamie & Jed !!!!! Dylan Sharma has been selected in the Wellington Under 19’ squad to compete in the National Tournament at Lincoln from 13th-21st December. 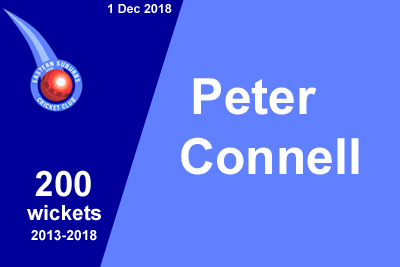 Peter Connell achieved his 200th wicket for Easts in the game against University on 1 December 2018. His 100th wicket was taken in 2016 and it hasn’t taken long to accumulate another 100. He has had a great start this year with three 5 wicket bags already!!!! 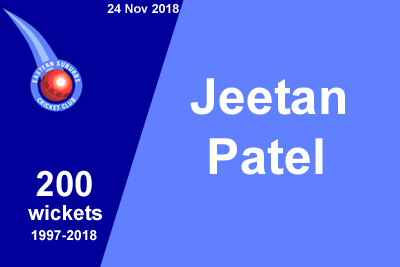 Jeetan Patel achieved his 200th wicket for Easts in the game against Wellington Collegians on 24 November 2018. His 100th wicket was taken in 2002 and has been away on International/Overseas duties but has continued to play for Easts when possible. Jeetan joined the club in 1997 so has been a member for 21 years - Awesome !!!! 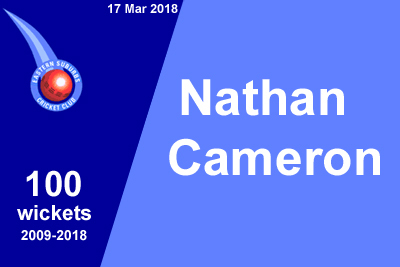 Nathan Cameron achieved his 100th wicket late last season for Easts in the game against Hutt Districts on 17 March 2018. The season started with the Premier Men & Premier Reserve teams playing against Hutt Districts. 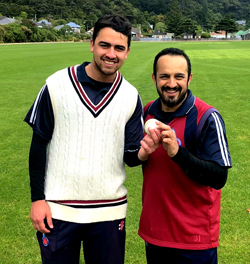 The Premier Reserve team bowlers were on fire and cleaned out Hutt Districts in 22.2 overs with Kaleb Gilhooly taking 6-10 off just 10 overs and then Haseeb Quazi striking a hattrick with the last 3 balls of the innings and he ended with 3-10 off 6.2 overs. Well done lads - great start !!!! 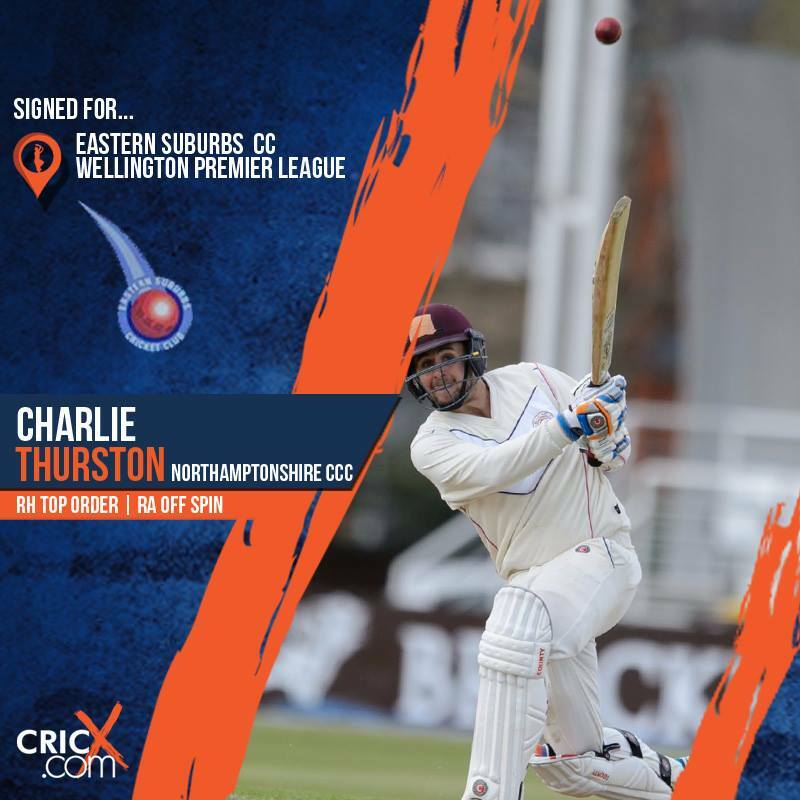 The Easts Club is pleased to announce the signing of 22 year old Northamptonshire batsman Charlie Thurston for the 2018/19 season. Welcome to THE MIGHTY EASTS Charlie !!! !